If you’re looking for an easy home makeover or a simple room refresh, we’re looking at the top furniture trends for 2019 so you can update any space in style. You’ll feel like a complete trendsetter by implementing these furniture trends culled from our decorators into you’re your up and coming home renovation. Take note of these furniture trends of 2019 so you can realize your home in up to date style that’s on trend for the year ahead and beyond. Plus, we’ll go over tired trends it’s about time to let go of for good. The thing to keep in mind when it comes to furniture trends is that they’re nowhere near as ephemeral and fleeting as fashion trends are, so when you do bring in on-trend décor, make sure it’s worth your time and investment so you can get the best use for the long run. Lush jewel tones evoke elegance and opulence; if you want to add a regal feel to your room, then jewel tones are a requisite way to go. As furniture trends go, classic jewel tones are pretty safe as they can be styled up or down and have the feeling of longevity about them. There is no denying that velvet has made a huge comeback and for good reason thanks to its silky and sumptuous feel. It’s a plush fabric and it’s certainly dramatic – velvet upholstery will make an elevated impact in any room while making it feel all the more grown up. To take the trend up a notch, combine jewel tones and velvet to make for the perfect decadent seating arrangement for 2019. The key here is to look for furnishings that boast modern silhouettes to keep the look fresh and not too vintage or retro-inspired. When you think of matte furniture, you may immediately think of white or black – but the latest furniture trends 2019 are bucking that feel for the unexpected. Inky blue, forest green and deep grey are refreshing takes on matte finished furnishings at the moment thanks to their fresh feel. Ditch standard white and black and make an impact with a bold, however, muted color. Nice to the touch, matte finishes can be more challenging to maintain and keep clean so make sure that you leave matte finishes and fabrications out of high-traffic areas to ensure a long lifespan. High-gloss finishes experienced a bit of a hiatus in 2018, but they are back in full force for 2019 furniture trends. The reflective nature of a high-gloss finish lightens and brightens a room by bouncing around light. High-gloss finishes lend your interior design an ultra-modern feel; whether that’s in your kitchen, bedroom or bathroom. High-gloss finishes also pair well with matte surfaces for the ultimate mix. That said, you can also bring in high-shine items more affordably via metallic picture frames and crystal accents. Terrazzo prints make for fun and colorful furniture designs; with their geometric elements and playful character. The strong patterns and bold colors also make them perfect for outdoor furniture, so if you are considering a garden revamp, palazzo prints could do wonders to brighten the space up. There’s something about terrazzo stone and prints that evoke a timeless, carefree spirit so have fun with it as this is one furniture trend that’s playful for playfulness’ sake. We love the vibe that lucite tables lend to modern décor, or just about any design style, from the traditional to the transitional. They are sleek and interesting, and they help create the feeling of more space in any room. They make for great coffee tables, end tables, and bedside tables and you’ll be on top of home furniture trends with brilliant lucite design. When it comes to small space decorating, lucite tables also work to make a room appear larger since they take up less visual floor space and they work to highlight what you place on them. If you haven’t heard of Hervé Van der Straeten, then it’s time to look the artist, jeweler, and design visionary up. We can’t get over how incredible and inspiring his abstract furniture creations are. He works mainly in bronze, incorporating other organic metals into his furniture design to create truly unique pieces. His designs are the pinnacle of modern furniture; clean lines and natural influences make his work sensational. Art Deco furniture trends seem here to stay – as they keep coming back year after year. High-shine metallics teamed with splashes of jewel tones always look stunning, especially when paired with the beautiful geometric designs we know and love from the Art Deco period. Introduce spirited Art Deco glamor in your home with glass, chrome, elegant mirrors, and bold symmetrical prints that are large in scale. Natural materials are reigning in furniture trends 2019. From stone to wood to natural textiles, natural materials are making a breakthrough in the ever-changing world of home furniture. Imagine natural stone planters on dramatic dark wood plant stands and upholstery in organic cotton and wool. By going natural you’ll also work to introduce fewer toxins into your home as cheaper furniture construction, materials, and finishes bring with them a slew of toxic chemicals in your home. Furniture trends in 2019 are becoming more environmentally conscious and focusing on recycling materials and increasing sustainability. You’ll be seeing plenty of furniture made from reclaimed wood and much more of a focus on using recycled elements and materials taken from responsibly managed sources. Look out for some creative designs made from even more creative articles. Old-fashioned florals and chintz patterns are breathing a breath of fresh air for many of the best furniture trends in 2019. Harking back to the traditional, floral patterns are taking over and are featured heavily on upholstery and soft furnishings like never before. Some of the best designs have a fresh twist to them, but personally, we can’t get enough of classic chintz after years of abstract graphics. The Memphis design movement was all about color, and its bold use of primary colors is throwing us back to the vibrancy of the 80’s with its return in 2019. With bold patterns and clashing colors, Memphis-inspired furniture speaks for itself and takes no prisoners. It’s powerful and iconic and we love the furniture trends the movement is inspiring at the moment. Handmade furniture will always be on trend – there is nothing like having a piece of furniture in your room which screams craftsmanship and custom design. 2019 furniture trends are seeing us once again appreciating the more bespoke, hand-crafted pieces that we haven’t seen for a while. Keep the craft alive and do your bit to support artisanal skills by buying handmade. Four poster beds are back in style thanks to the modern spin furniture makers have crafted for the year ahead. Four poster furniture trends boast clean lines, darker colors, and subtle impact unlike before, where canopy beds were heavy and took up a lot of visual space. With or without a canopy, a four-poster bed is the poster-child of luxury for your bedroom. Continuing with the handmade furniture trends, custom furniture seems all the more viable at the moment. The great thing about custom designed furniture is that it is bespoke to you, it’s one of a kind, and it fits your space perfectly. Yes, we know it’s a bit more of an investment than other furniture purchases, but the grand statement they make is surely worth it. Optical prints add an element of illusion to your furnishings. Abstract, seamless patterns make for fun and interesting fabrications that you can use to make an impact in your home. A few bold colors make for an unforgettable impression, in keeping with the themes of bright color and geometry that we are seeing for future furniture trends. In the midst of all this pattern and bold color, it’s refreshing to see minimal designs with clean lines popping up here and there. Contrasting directly with the strong colors and form that are featuring heavily in furniture trends, minimalistic designs take the edge off. Sticking with the Art Deco designs that we have been seeing, bar carts are also making a seriously stylish comeback. Strong lines and high-shine metallic materials make ensure a bar cart to be the centerpiece of a room. Style your bar cart with a variety of decanters, bottles, and glasses in different scales and heights for a fully realized effect. Built-in banquettes are luxurious and make your dining area design a little bit different. 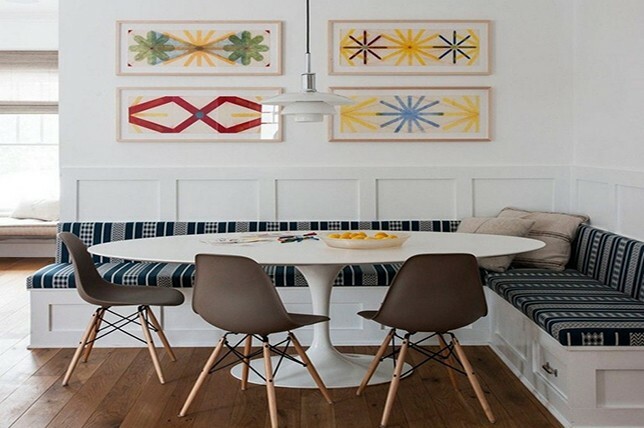 Why not use some of the colors and prints we have been seeing in 2019 furniture trends to make an impactful seating area around your table. Plus, you can use the area underneath your built-in for storage while possibly adding value to your home’s resale potential. Furniture trends of the past may have left you fearful of mixing metals – but, mixing metals is ‘in’ and we think it looks stunning. Putting together silver, gold, and rose gold in one room creates a chic and glamorous look. Imagine rose gold accessories, gold light fittings, and silver chair legs in the mix. Mason Jars – Sure, there’s joy to be found in recycling and repurposing items in your home, however, said approaches should be left out of your décor repertoire as they can come off as immature, low-budget, and all too common and young. Instead, leave mason jars for storage areas and for chores as they can come in better use in different ways. Farmhouse Style – Enough with the swinging barn doors and mechanisms in an otherwise completely contemporary home. Simply put, unless you actually live in a refurbished barn, there’s no reason to bring the look into your home. Upcycled Décor – Just like mason jars upcycled furnishings and décor look uninspiring and should be left for your local pub or burger joint to utilize. Don’t believe us? When was the last time you were truly captivated by the luxurious feel and beautiful styling of something upcycled? Yup – we didn’t think so. Crafty Reclaimed Wood – We’ve said it before and we’ll say it again; you can actually have too many crafty items in your home. Leave the crafty finds for diehard Etsy aesthetes and bring in serious, adult décor. Inspiring Signs – We all know how to live, laugh, love and breath, so do you really need a massive reminder on your wall or on a throw pillow? The answer is a simple and immediate no. Save your walls for actual art and leave the motivational signs for life coaches. Wall Decals – Again, leave your wall space free for actual art as nothing looks cheaper and more gimmicky than an oversized wall decal covering valuable real estate. Faux Paint Techniques – The same goes for faux paint finishes as they look incomplete, cheap, and seriously tacky.